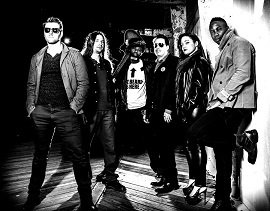 Midnight Mosaic is an eclectic collective of entertainers, whose original brand of Rock ‘n Soul drives their audiences to dance and groove. By combining the familiar tones of soul, funk, dance, and pop they have put their own spin on the Indie rock sound. Influenced, by bands such as Chromeo, The Red Hot Chili Peppers, and The Talking Heads this band is truly a montage of its members’ individual sonic signatures.